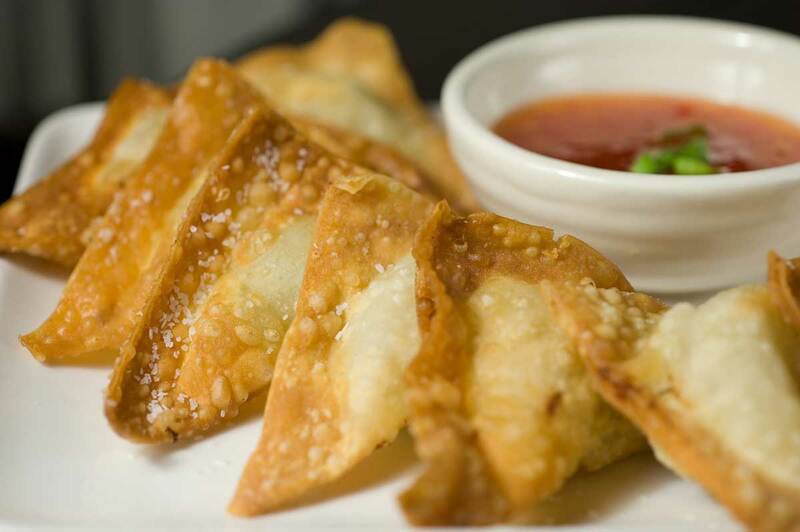 Whenever I go out to an Asian restaurant, one of the first things that I always look for is wontons. There is just something about biting into the crispy wrapper to reveal a savory, flavorful filling. Since I do love them so much I thought I would tackle making them at home. For this wonton recipe, I combine ground pork with green onions, water chestnuts, fresh garlic and a few simple seasonings before wrapping the mixture in a wonton wrapper and frying until golden brown. Serve with a side of sweet thai chili sauce and all is right with the world. The best thing about this recipe is that it makes so many, why is that a good thing you ask? Well because they freeze really well. Just lay them in a single layer on a baking sheet, pop them in the freezer and once they are frozen you can divide them up into separate freezer bags. Then, whenever you get a craving for some crispy fried pork goodness you can just take them out of your freezer and fry them up. They also make a great appetizer to serve with Ground Turkey Stir Fry . In a bowl combine all of the ingredients, except the wonton wrappers, and mix until combined. To make the wontons, place a teaspoonful of the pork mixture in the center of the wonton wrapper, dip your finger into the bowl of water and run your finger along the edges of the wrapper. Fold bottom corner of the wrapper over the filling and press all edges to close the wrapper, you'll have a triangle. (Note: When making these use a damp paper towel to cover the wonton wrappers, otherwise they may dry out before you have a chance to fill them). In a large pot, preheat the canola oil over medium high heat. Once the oil is hot, fry until golden brown. About 3-4 minutes on each side. Sprinkle with salt ,if desired, and serve. make these right now. Wish me luck! Can I freeze them and heat later? Those wontons look fabulous! I’ve never made them BUT your recipe looks delicious and easy. I’m going for it ~ Thanks!! Yummy, I love wantons, be it steamed, in soup or deep fried. Delicious! Thanks for the comment jo!